Bradshaw (Gwion Gwion) paintings could provide answers to archaeology's big questions.They are very old, yet beautifully painted. Most of them are well hidden in the Kimberley. What is Bradshaw (Gwion Gwion) rock art? Today the Ngarinyin people of the Kimberley are the custodians of this art form. The ancient Bradshaw rock paintings are very different to any other Aboriginal rock art found in Australia. They depict graceful human figures engaged in display or hunt. Figures are beautifully painted, adorned with tassels, hair ornaments and even clothing. The compositions finely balanced. Some of the paintings are small, others up to 5 metres long and 3 metres high. 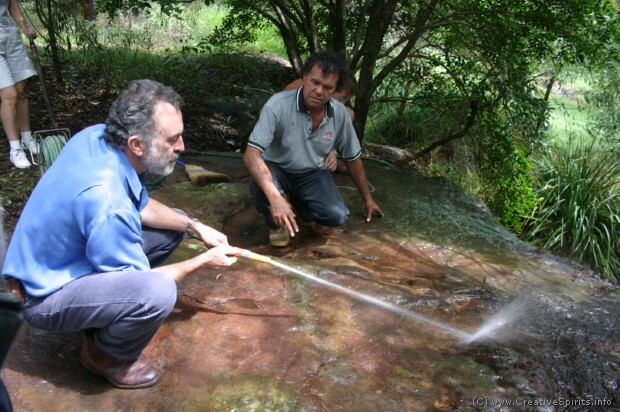 At first glimpse, the Gwions appear different from the Wandjina rock art which is a more abstract style painted in the past 3,500 years and directly related to living Aboriginal culture. Maybe artists had changed materials from impermanent to permanent surfaces? At the height of the Last Glacial Maximum, 18,000 to 20,000 years ago, conditions became so harsh and arid that the majority of the population left the Kimberley, which was largely abandoned for the next 8,000 to 10,000 years. The Gwion artists disappeared, leaving their magnificent paintings, but barely another trace of their existence. Gwion rock art ceased, as suddenly as it had begun. "Tassel” era. This is the earliest era. Paintings depict happy days. Slender men and women are adorned with multi-strand tassels swinging from waist- bands, armlets, anklets, chest-plates, bangles; all topped with headdresses featuring pompoms and plumes. “Sash” era. Tassels are replaced with three-point sashes flaring from waistbands. Both tassel and sash Gwion figures frequently seem in ceremonial mode and float in a trance-like state. "Elegant action” figures. This era marks an abrupt change. Stripped of all adornments, bar headdresses, people are portrayed running, leaping, busily gathering with dillybags, hunting kangaroos. Society has become more vigilant in order to survive, as the climate grows colder and aridity increases. “Clothes peg” figures. The once celebratory sash and tassel figures are now transformed into linear soldier-like clothes-peg figures, practical bodies hunting with bundles of spears, armed with spear throwers and boomerangs. Aggressive groups are shown in battle, presumably fighting over rapidly diminishing resources and last vestiges of favourable territory. The Elders revealed how Gwion Gwion rock art and Wunan law of blood and land are inseparable, and still alive at the heart of Ngarinyin culture. The Gwion Gwion artworks document and perpetuate this law and serve as "established legal documents"  creating separate legal districts. They inform and communicate legal, familial and environmental responsibilities. Jenagi Jenagi were artists as messengers who imported and exported sacred objects along exchange routes (pathways). However, as with most Aboriginal art, they often hide many layers of knowledge. "It will take us years to record enough graphic evidence and translate all the meanings related to the significant elements in [just] this one painting", concedes Jeff Doring, who recorded the Elders during the Pathways Project. Understanding country is key to understanding the rock art. Where can I find Gwion Gwion art? 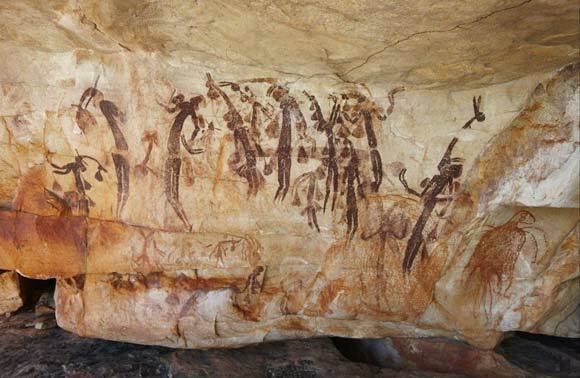 Gwion paintings lie deliberately hidden in inaccessible rock shelters in the vast Kimberley in Western Australia. They extend across an arc of the north Kimberley, around the Roe River. Due to the remoteness of the 420,000-square kilometre Kimberley, and the hidden locations, the art was left largely undisturbed, not researched and unrecorded. No-one knows how many paintings there are and if all of them will ever be found. Experts estimate there are hundreds of thousands of Gwion paintings. In 1977, Grahame Walsh, from Queensland, began a 30-year campaign to comb the Kimberley for Bradshaw rock art. He photographed, sketched and documented his extensive lay field research, identified some 300 recurring motifs in the paintings and sought to unlock a code to interpret meanings. Why is this Aboriginal rock art so important? how often these people moved to and from neighbouring countries. A major hurdle in understanding the Gwions is the lack of accurate dates. To date a Gwion painting using radiocarbon dating, the paint needs to contain organic material, such as animal fat, plant material or blood, but no such samples have yet been found. The Bradshaws let Grahame Walsh propose a controversial hypothesis: instead of Australia being continuously settled for 50,000 to 55,000 years by ancestors of contemporary Aboriginal people, Walsh suggested that waves of populations arrived. And one of these waves could have been people from a different ethnic identity, who created the Bradshaws. Gwion art written history only begins in 1891, when Melbournian pastoralist Joseph Bradshaw became the first European to discover this stylish rock art after exploring land he had been granted in the Kimberley. The art later became popularly known as the Bradshaws. Grahame Walsh died in 2007, aged 62. The Bradshaw Foundation Australia has a lot of information about the Bradshaw paintings, explaining in detail the different eras. Their website also has a large photo gallery. 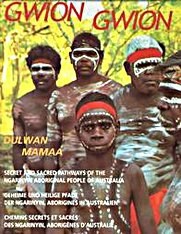 The Book Gwion Gwion Dulwan Mamaa: Secret and Sacred Pathways of the Ngarinyin Aboriginal people of Australia is out of print, but you can try to find it on eBay or used copies on Amazon. Aboriginal art: Rich profits, poor artists? Are dot paintings traditional Aboriginal art?